Hundreds gathered at the Bomana War Cemetery as early as 4 AM this morning to commemorate the 75th Anniversary of the New Guinea Campaign of the ANZAC Day Memorial Service. In attendance the visiting Australian Governor General, General Sir Peter Cosgrove, PNG Governor General Bob Dadae and Prime Minister Peter O'Neill among foreign dignitaries, and relatives of ex service-men and women. Sir Peter Cosgrove says ANZAC is a significant time they reflect on Ex-Service men and women that served during WWI and WWII. "At services, memorials, turfs and clubs around Australia and indeed right around the world. Australians come together on ANZAC day to remember and reflect on the considerable history of our nation at war. Inevitably our minds turn to the terrible events of World War One. In battles in places like Gallipoli, Posiez and Villace Britinaire, Aussie diggers who fought with the bravery and the spirit that shaped a young nation and continues to resonate to this day. But of course, there have also been many other significant conflicts at other places at other times. This year marks the 75th anniversary of the vicious struggle to prevent the capture of Port Moresby and that drawn out battle on the legendary Kokoda track. 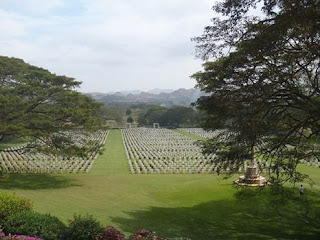 Here inside the Bomana cemetery lie men women of the three services who gave their lives to keep Australia safe and liberate the people of PNG during the second World War,” said Sir Peter Cosgrove.